My labour started, naturally, thank goodness on the morning of the 25th September 2008 which was also my husbands birthday. I was however booked to go in for an induction but we were sent home for labour to continue. We had been living in Dubai, for about 3 years, had our fist home and got married there too. It was a warm day but not “Dubai warm” and on the drive home along the endless motorway through the desert, I remember how excited I was that we were going to meet our little boy, we were going to be parents in the next 24 hours or so! Little did I know! It turned out that I was in labour for the next 28 hours unfortunately, as at about 4pm that same day when the contractions were getting stronger we made our way back to the American Hospital. I kept calling it a hotel as it had the same look and feel as one of the fancy hotels in Dubai and I had to remind myself, it was not going to be the most relaxing visit but it would be rewarding. I had been labouring on in total for 26 hours and had the help of the loveliest South African Midwife, I am originally from South Africa so having a woman who knew her stuff about baby delivery delivery did make me feel more relaxed. My husband David was there the whole time and was doing everything he could to help too. I was in the final pushing phase and had been at it for about 2 hours when I felt my baby move back up, it was just not working. The lovely midwife, I wish I remembered her name, went to consult with the obstetrician and it was decided that I was to have a C-Section and it was to happen rather quickly as baby was getting quite distressed. So two minutes later, there I am, sitting on the edge of the bed with my chin to my chest, trying to round my back as much as possible as the middle-eastern anaesthetist, who spoke in broken english was positioned to insert a fairly large needle into my spine. The man brought his face closer to mine and said in a lowered tone “be very still, this is my first time to do this”. You can imagine the look on my face as my eyes widened very quickly and my husband quickly glanced at each other, there were a few moments of silence…..then the nurse and the anaesthetist broke into raucous laughter and the nurse said “he says that every time”. The contractions were still very regular and vicious so we had to wait until that particular one had passed and I had to stop myself from physically showing this man how funny his joke really was!! The needle went in and with a strange crackling, lightning bolt sensation a feeling of nothing-ness eventually spread all the way down, from my chest to my toes, I was quickly relieved of the pain in my body from my lower chest down. I was quickly wheeled into theatre, where my husband and I looked around and at each other, listening from behind the green paper screen to hear anything. I felt a strange pulling and tugging and next thing we hear the most amazing sound as the little purple face was brought up above the screen for us to see his little face - it was our little boy screaming with his first breath. The most beautiful and amazing memory was the instant recognition of the shape of his lips and the shape of is nose being from us, his parents. He was placed on my chest and we both cried our eyes out, with the overwhelmingly intense feelings of love we felt for this little person. We could not believe that we made a baby, never mind a baby as beautiful and perfect as the one we were holding. My husband was asked at every opportunity to take photos and we got the staff of the hospital to take photos too. I wanted to savour every little moment. I wished that I had a digital memory in my head to save that moment too. However it was so super special that I will never ever forget it. So all in all the labour part was 26 hours, the pushing part was two hours, the C-Section was probably about 45 minutes. My husband David had a proper bed in the hospital room and he obviously stayed over. We loved so many names but we decided on Kyle Alexander Peter Russell. We continuously snapped away trying to capture every angle of Kyle. My parents got a taxi back to our house and two days later we were free to leave with our little bundle. So my husband slowly wheeled myself and Kyle out of the hospital and when were just outside the hospital doors, I got out of the wheelchair and we looked at each other with fear and delight on our faces. We both felt, is that it, we can just take the baby, there is nobody to check if we are going to be good parents that the baby is going to be ok. It was really pretty scary, the weight of responsibility slowly started to put its feet firmly on our shoulders. We were up for it, we were parents now - it felt so good -but still scary. The next week friends of ours gave us a voucher for a photography studio and at 3 weeks of age we took ourselves and Kyle to get our very first family photos done. We have these lovely framed images on the wall in our sitting room and we treasure them. I doubt wether we would have had them framed if we had bought prints from the photographer, but thinking back the photographer did not sell prints or digital images - only framed images! 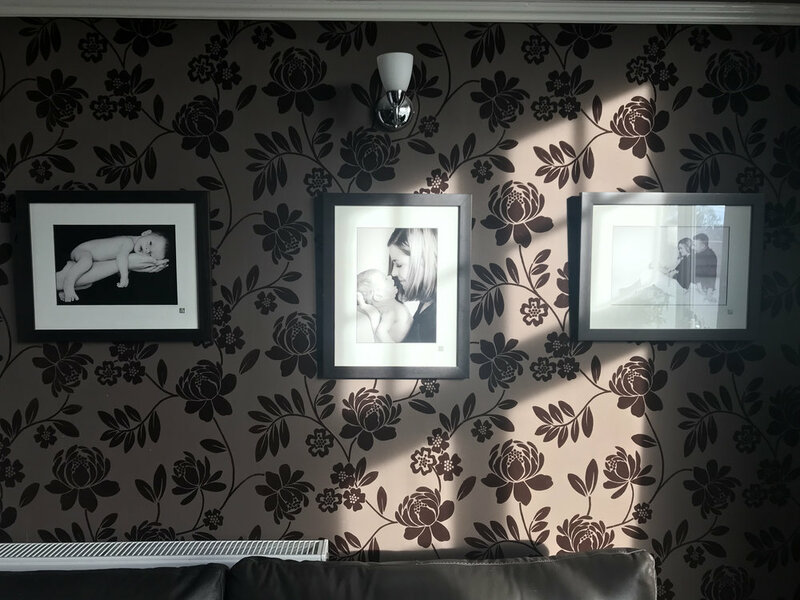 The experience of going for the newborn session stayed with me and when we moved back to Scotland, a year later, I decided that I wanted to get a formal qualification in photography. I went on to achieve a B.A in Photography and got a distinction too. I will have to write about my youngest son, Lewis who, was born here in Scotland, in my next blog.